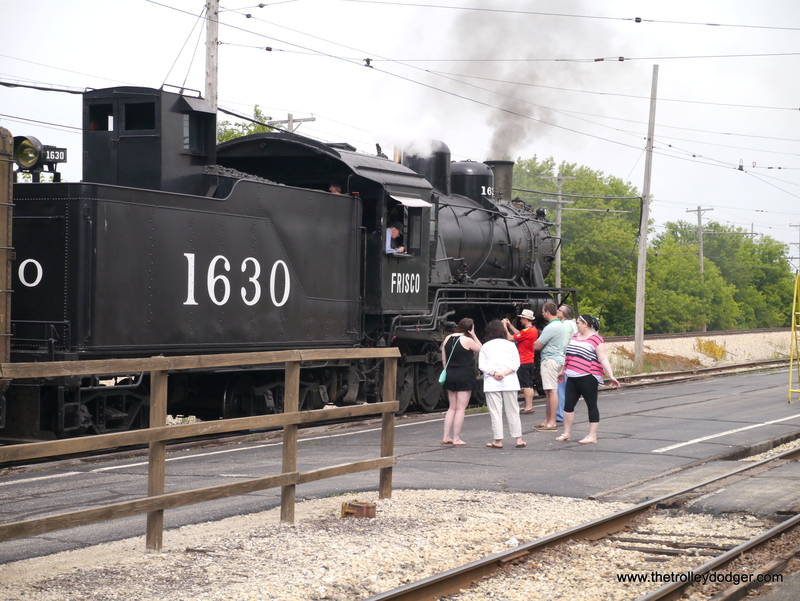 Last Saturday (June 20th) was Chicago Day at the Illinois Railway Museum, and I am glad to have made the trip in spite of the lack of sunshine for pictures (well, there were maybe a few seconds of sun in the afternoon). 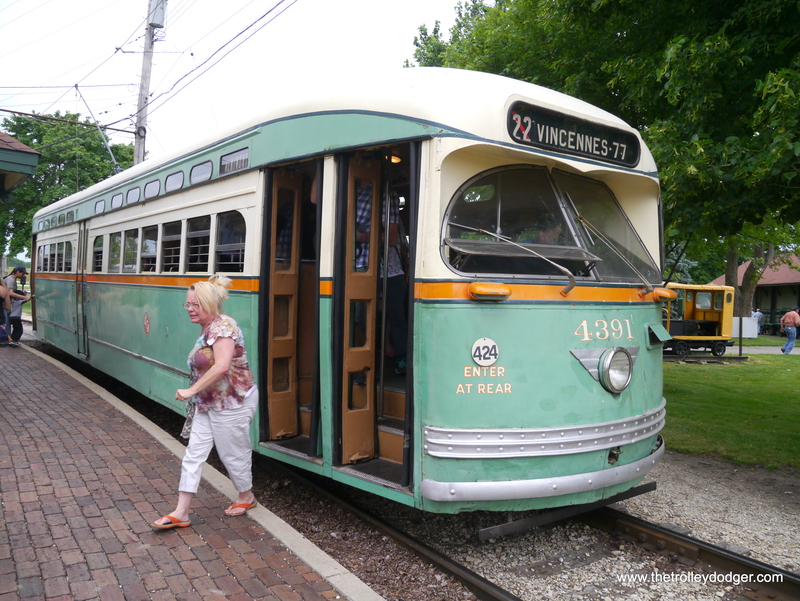 They were running lots of Chicago equipment, naturally, including PCC 4391, to mark the 57th anniversary of when the last streetcar ran in Chicago (the actual anniversary was Sunday, the 21st). 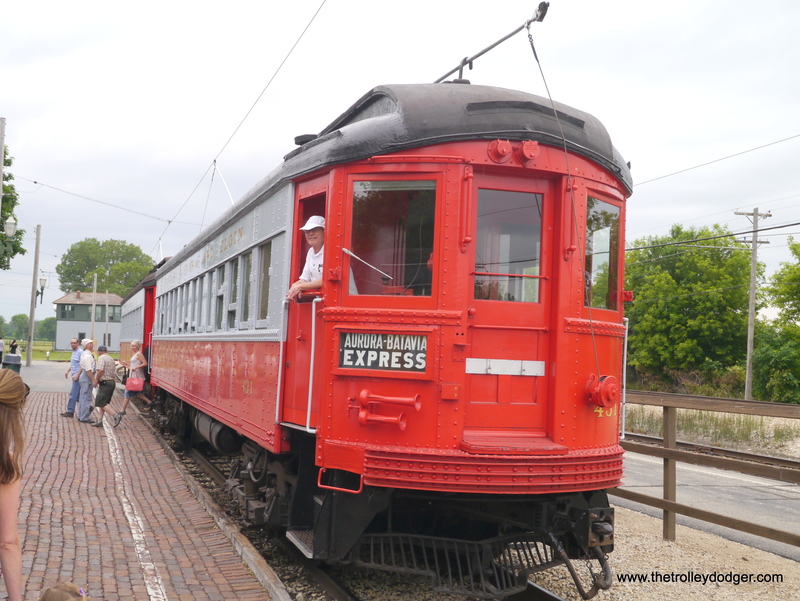 Unfortunately we did not have a chance to ride the CA&E train or the two-car train of Chicago wooden “L” cars that was running. 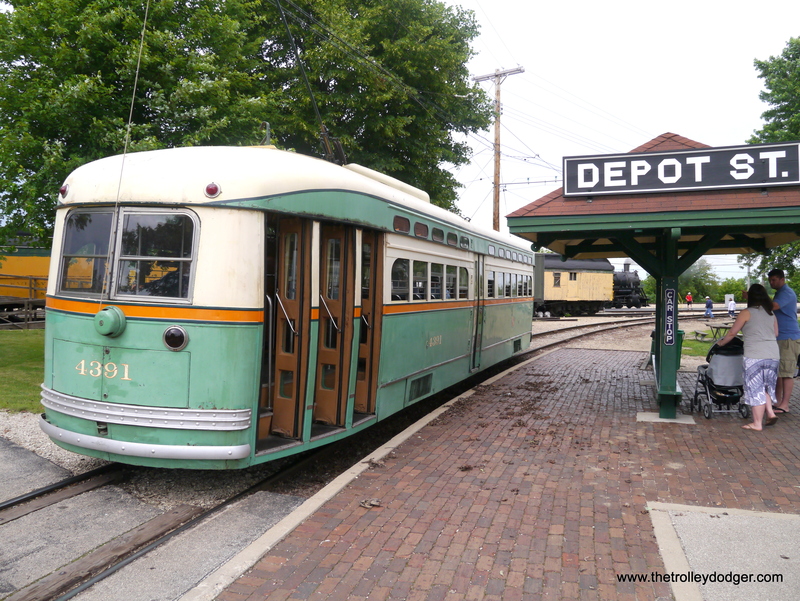 But with the 4th of July and the annual Trolley Pageant just around the corner, you can be sure that we’ll be back. PS- This our 50th post on this blog, and we would like to thank everyone who has read it. To date we have had 41,576 page views and have been visited by 12,462 individuals, so I’d say we are off to a good start after our first five months. We’ve also just set a new record for page views in one month. By the end of June, we expect to have more than 11,000. 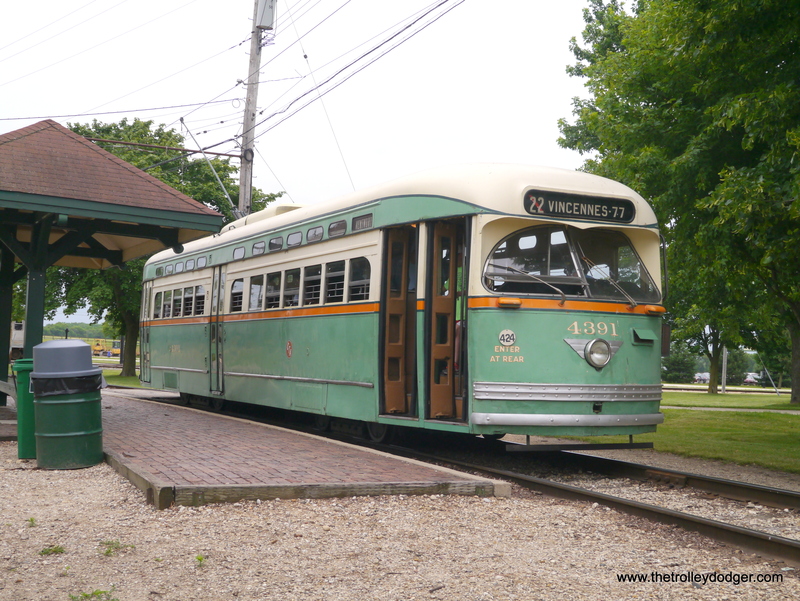 If you enjoy the pictures of PCC 4391, don’t forget our newest Trolley Dodger Press publication Chicago’s PCC Streetcars: The Rest of the Story, which you can find in our online store. 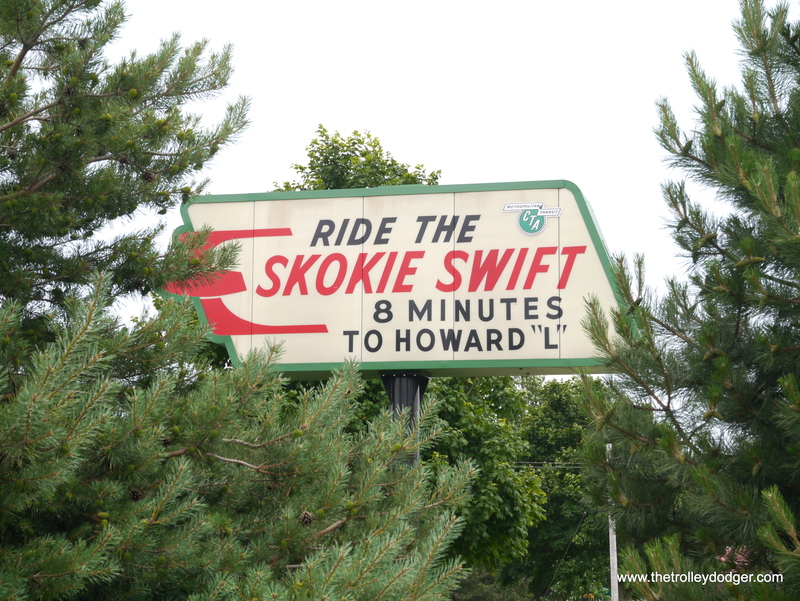 The Skokie Swift, or Yellow Line as it is now called, doesn’t make the trip between Howard and Dempster in 8 minutes right now, since the embankment gave way last month. Press reports say it will be out of action until October, but meanwhile this old sign is a reminder of swifter days that once were. 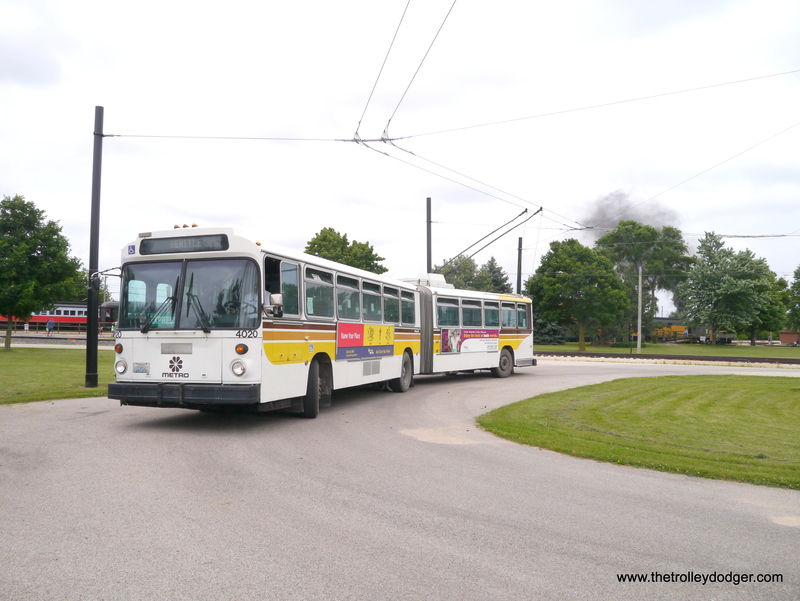 The Milwaukee trolley coach prepares to loop. 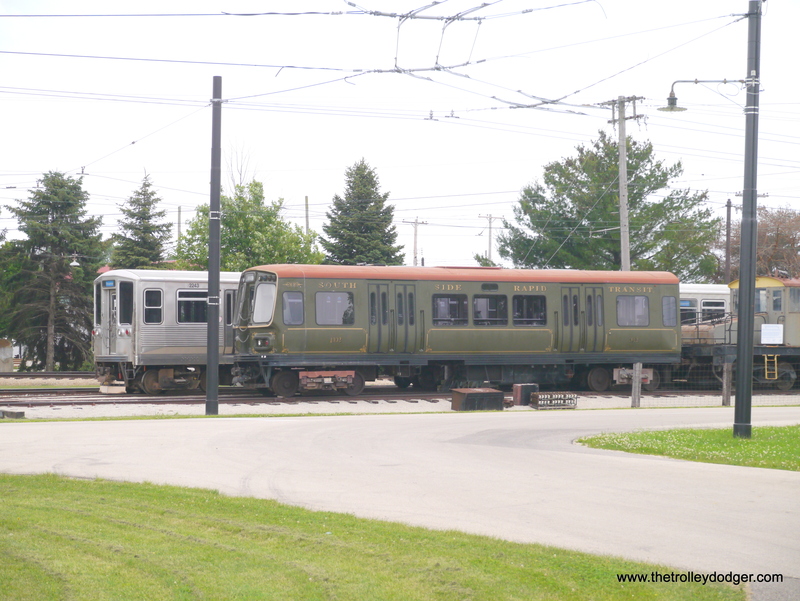 Half of a 2000-series married pair, currently separated, is stored at 50th Avenue station. 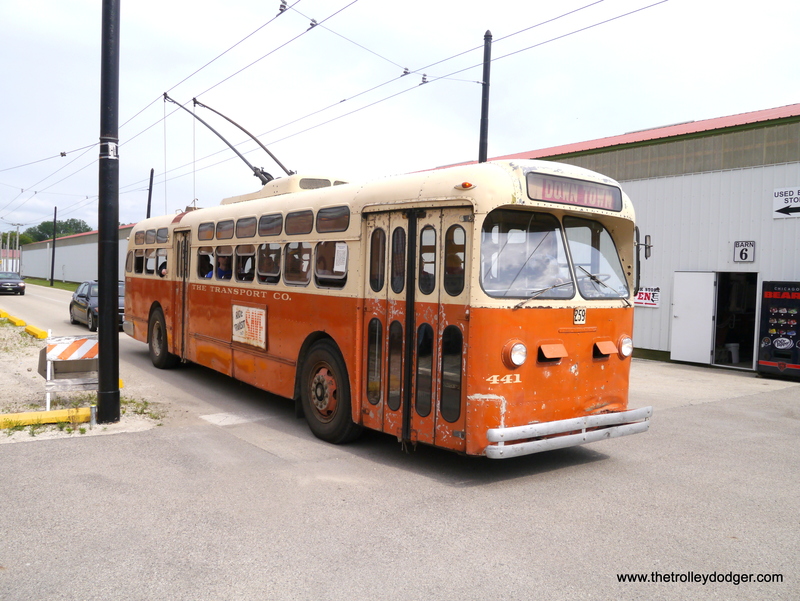 The articulated Seattle trolley coach. 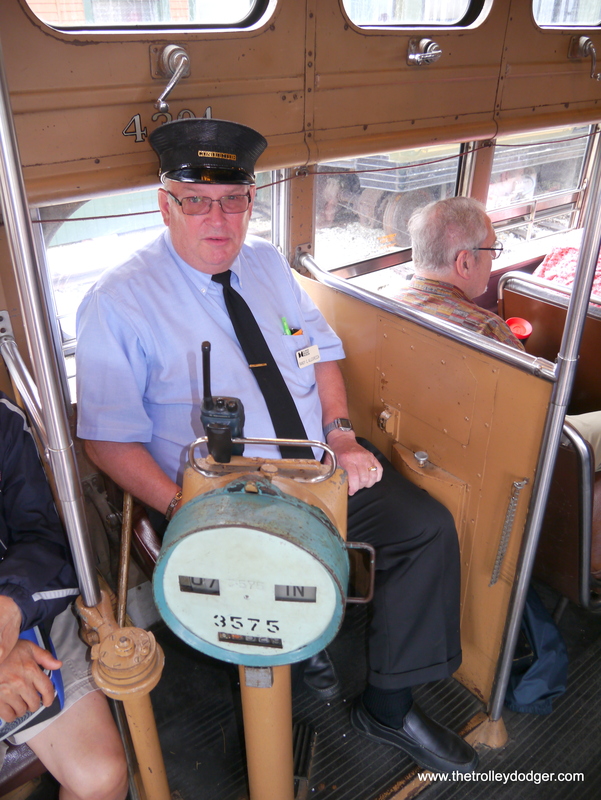 The conductor’s station on Chicago PCC 4391. Enter at rear, exit at the front. 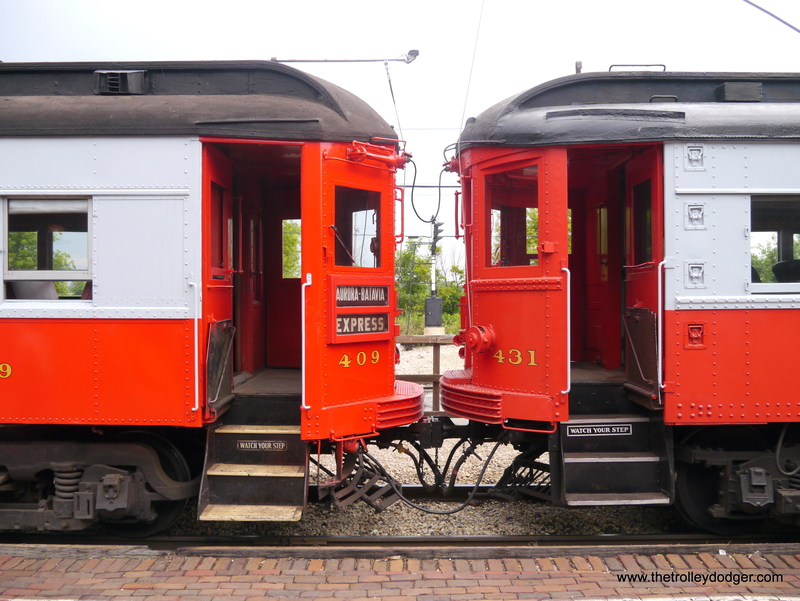 A two-car CA&E interurban made up of 431 and 409. CTA 41 heads up a two car train of single car units. 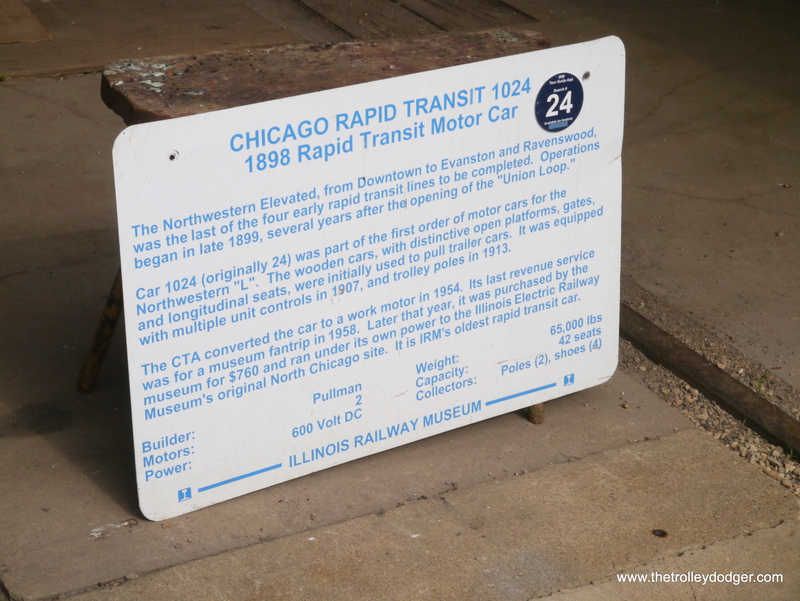 I used to ride these cars on the Evanston Express. 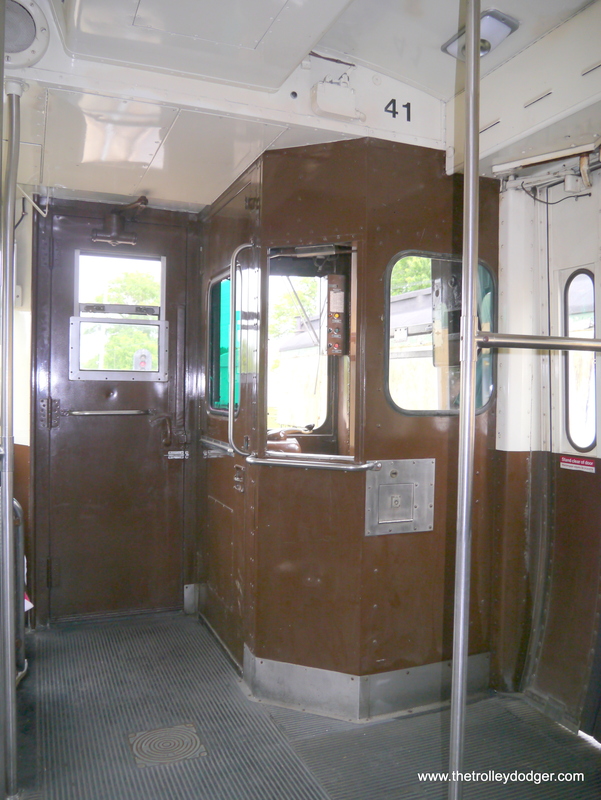 Operator’s station on car 41. 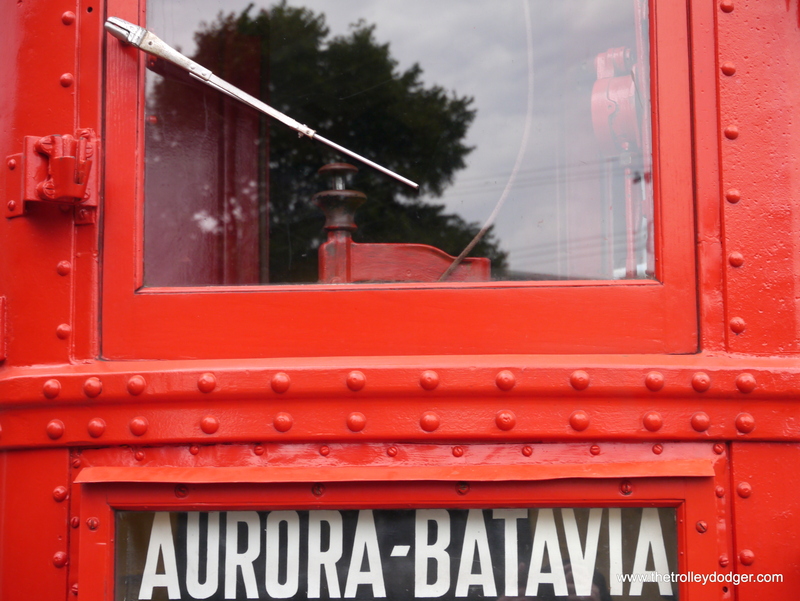 When fares were collected on board the train in Evanston, there would have been a farebox installed here. Steam is alive and well at Union. 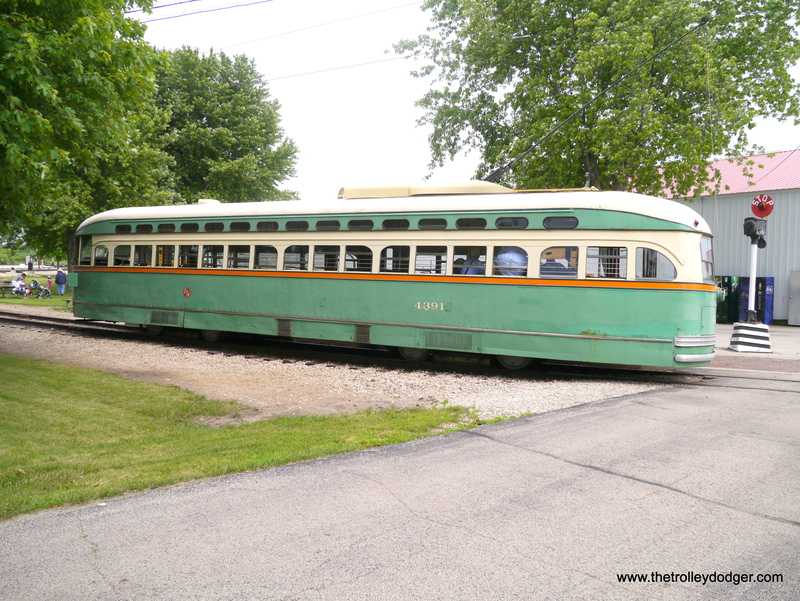 Back end of the “L” train. The “blind side” of 4391. 4391 almost looks ready to back into traffic at the “wye” at 81st and Halsted. 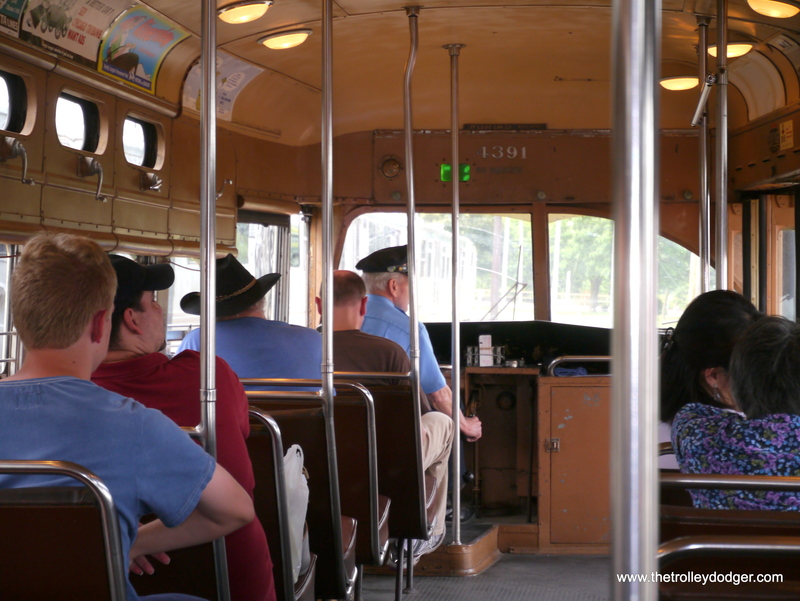 Three sets of doors allow for lots of people to board the streetcar quickly. 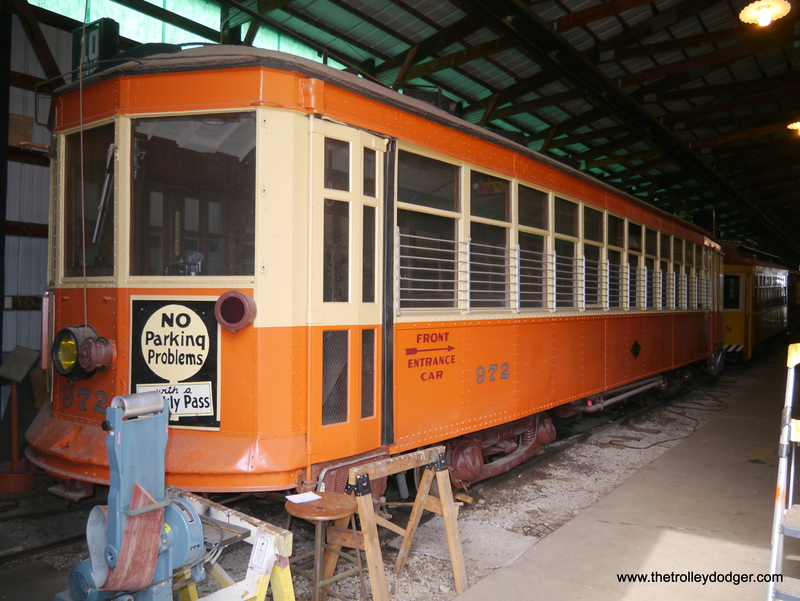 CTA wooden “L” car 1024, being restored to its original condition as #24. 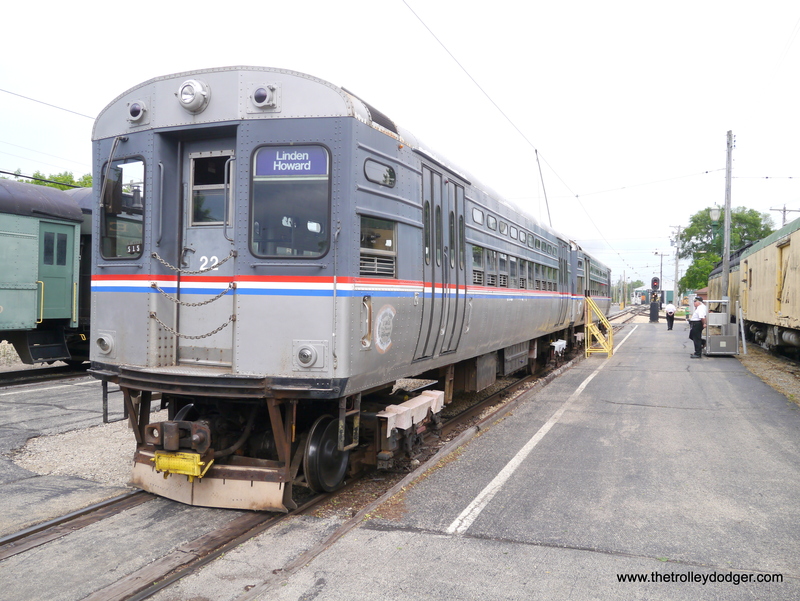 Since this was the 50th anniversary of the end of Milwaukee traction, I thought it would be fitting to include a picture of Milwaukee car 972. 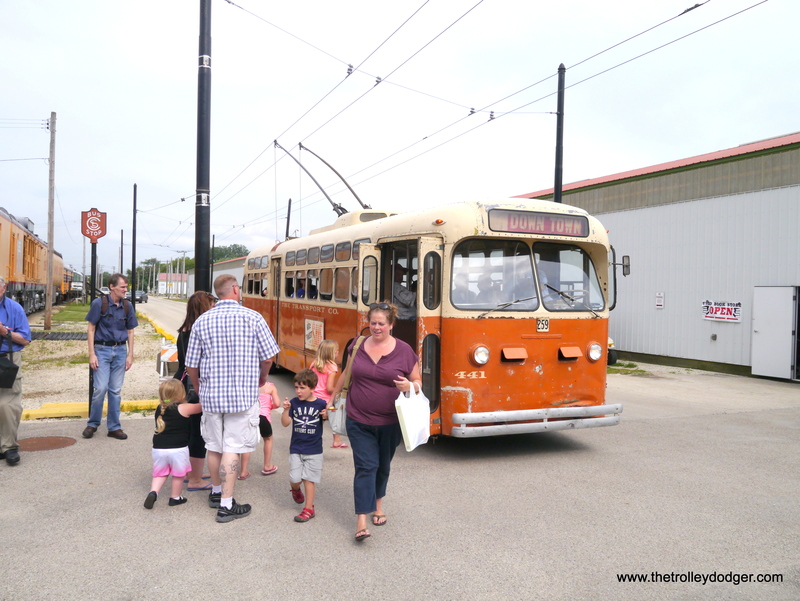 While in general railfans like to take pictures without anyone in them, this shows that people enjoyed riding the Milwaukee trolley bus. Now a shot sans visitors. Dark clouds started approaching late in the afternoon. Soon it began to rain, and closing time at the museum was near. A close-up view, showing a classic C-165 controller. 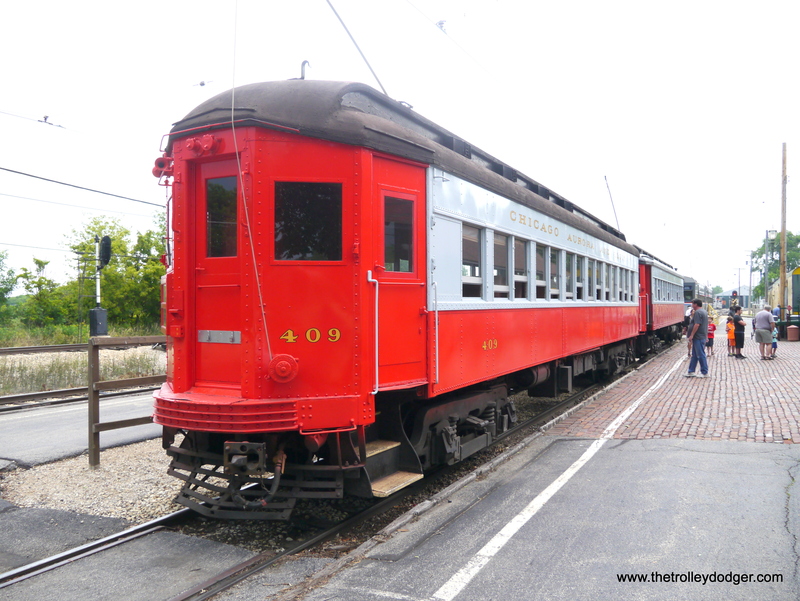 This shows the differences between CA&E cars 409, the sole Pullman saved in its class, and 431. 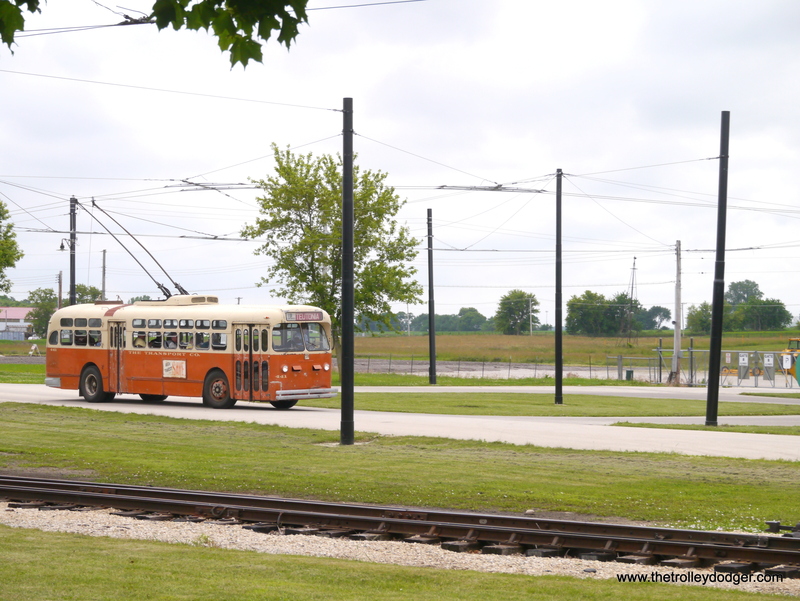 With bad weather approaching, we bade farewell to IRM. Maybe next time we’ll get to ride these cars. 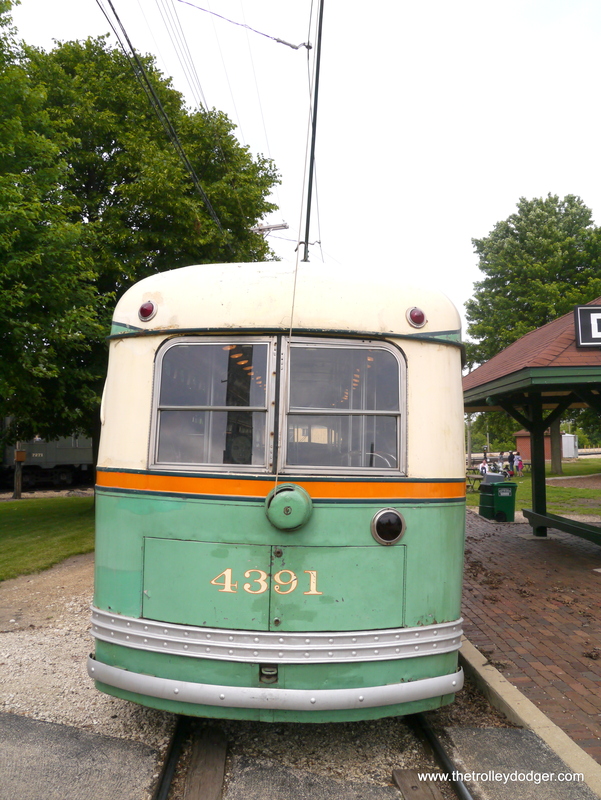 I didn’t realise that IRM got the old sign from Skokie. Good to see it preserved. 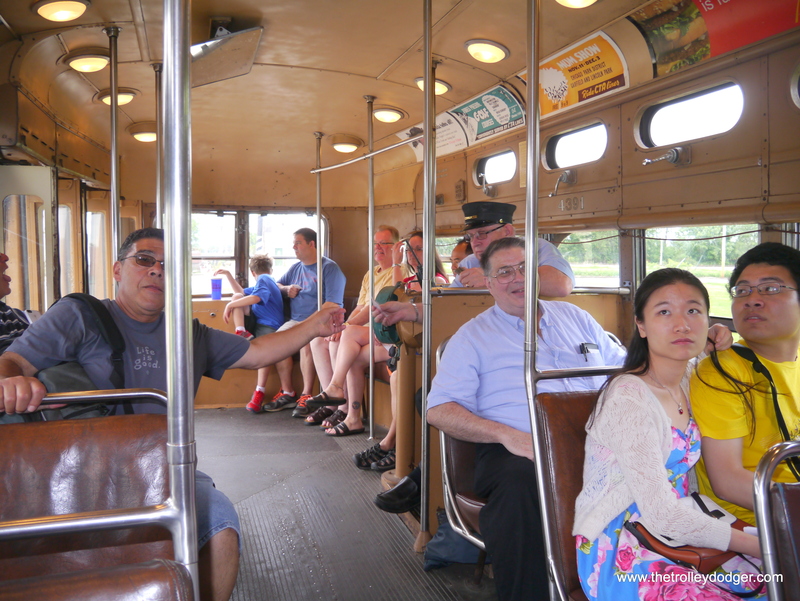 Yes, and in 1964, when I first rode it, the time was more like 6 1/2 minutes end to end. Those souped-up “spam cans” shook, rattled and rolled a lot but they sure got you there in a hurry. What a thrilling ride. Congratulations on the 50th post! You do a terrific job with this blog and I’m always curious to see what is going to show up next. Keep up the great work! Just some minor nit-picking: the controller on CA&E 431 isn’t a K-controller, it’s actually a C-165. This is a master controller designed for used with GE Type M control, which was fitted to the entire CA&E passenger fleet. 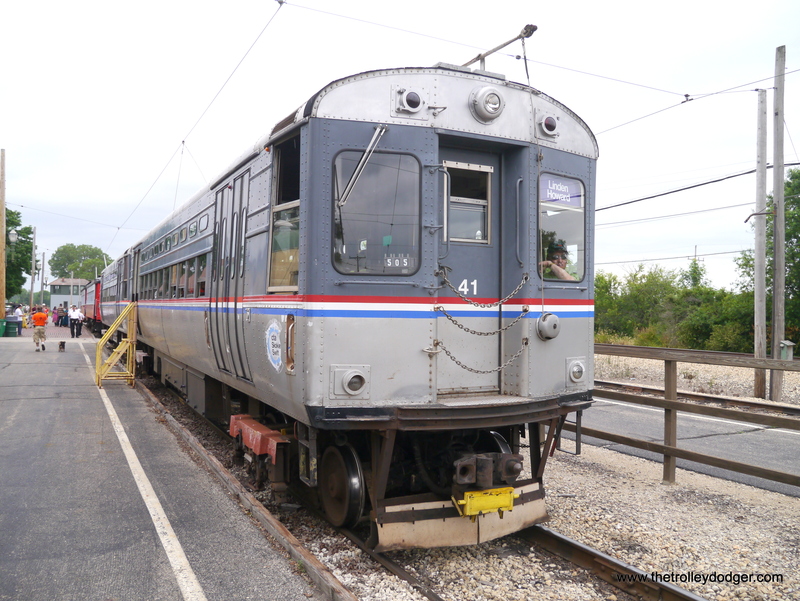 Different car types on the CA&E used different variants of both master controllers and contactors but it was all Type M.
Thank for the correction. I will update the caption. 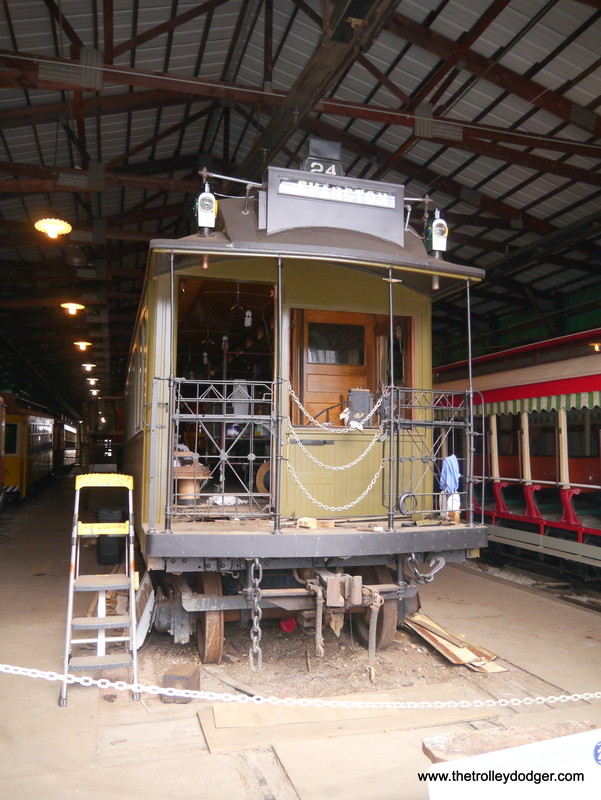 The restored cars at IRM, to quote Louella Parsons (remember her? 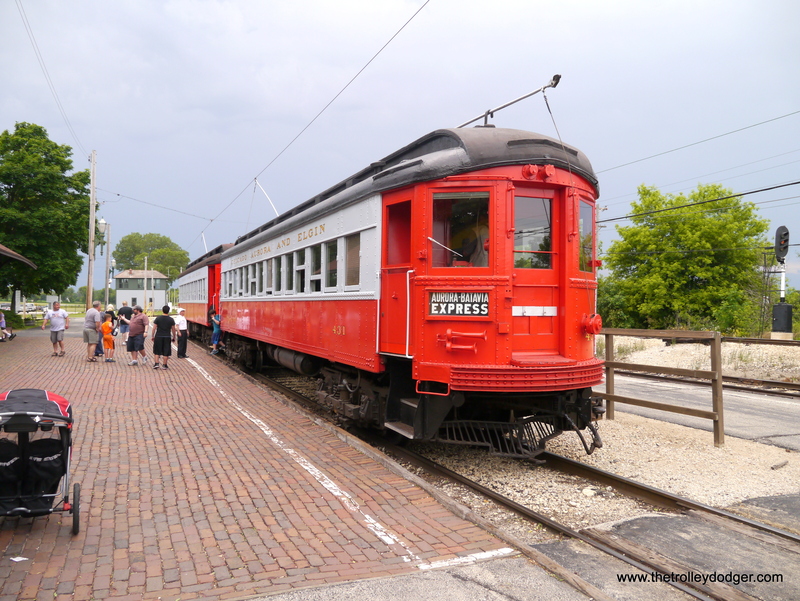 ), “never looked lovelier.” The IRM volunteers deserve a lot of credit and praise for their hard work. I am concerned that the skills they exhibit may die out in the future as this country’s manufacturing is shipped overseas.